It seems that Kaye Williams, the founder and owner/operator of Captain’s Cove Seaport in Bridgeport, CT, never stops working. When WindCheck arrived for an interview (On Watch, July 2012), the 83-year-old Williams was busy sweeping the front steps of the marina office – during a break from building new decorative signs for the popular Park City attraction. With fresh ideas always in his head, he’s never without a pencil for a quick sketch – the well-used pencil he showed us was scarcely over an inch long. Many have compared Williams to Bridgeport’s most famous citizen, P. T. Barnum, and with their strong work ethic, entrepreneurial spirit and formidable promotional prowess, they have much in common. Williams’ entrepreneurial ventures began at a young age. Having left school in the fifth grade he put his love of boats to work, ferrying passengers across Cedar Creek in his skiff and earning five cents per person. 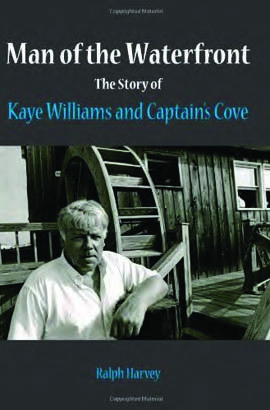 Ralph Harvey, who spent a decade researching and writing this fascinating book, refers to him as “Bridgeport’s youngest entrepreneur.” Later enterprises included Fayerweather Marine, a boat dealership that he built with his own hands, a lobster boat that he and his wife Vivian owned and operated for 10 years, the acquisition and renovation of a derelict marina in Black Rock Harbor that became Captain’s Cove, and the purchase of the 179- foot frigate Rose, a replica of a British warship. Williams wanted Captain’s Cove to highlight Bridgeport’s maritime heritage and attract tourists to the struggling city. Since opening day in 1982, “The Cove” has always been what he calls “a people’s place,” with free admission and reasonably priced food. “The family that works together stays together,” said Williams during our interview, and The Cove’s success owes to the tireless devotion of the entire Williams family, including Kaye and Vivian’s children Bruce, Jan and Jill, Jan’s husband Rob Burlinson and Jill’s husband David Toth. Williams also funded the construction of a replica of aviation pioneer Gustave Whitehead’s Airplane No. 21, which, as many Bridgeporters will tell you, flew two years before the Wright brothers. A photo of the replica in flight is one of many images in this book. “Being Kaye’s biographer has been a great honor,” said Ralph Harvey. “Kaye has shown the world what a huge difference one person can make. That difference is his legacy.” Harvey, who also wrote Developing The Gull-Winged F4U Corsair – And Taking It To Sea, resides in Stratford, CT. Man of the Waterfront is available at amazon.com.